We got a little more idea when the flooding will start in the metro area today. 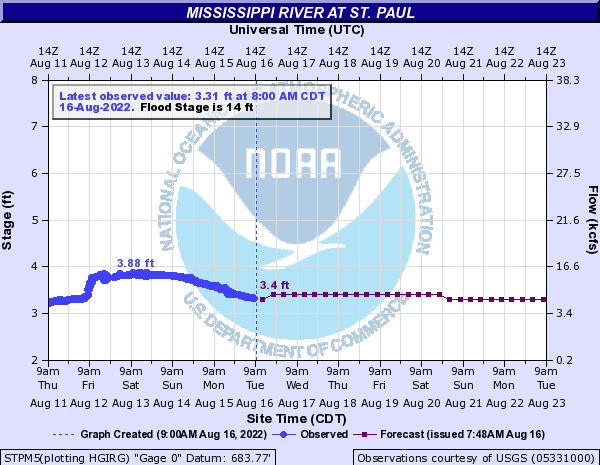 The latest National Weather Service prediction says the Mississippi River in St. Paul will reach flood stage next Thursday. Even with all the melting, the river has only increased by about 6 inches in the last 24 hours. And though many of the headlines are blaring references to “flood stage,” the reality is a river’s “flood stage” is no big deal. For example, here’s what the Mississippi River looks like on Raspberry Island in St. Paul when it reaches “flood stage.” It’s not a big deal unless you’re a shrub. Further downstream, the water will have started to creep over the banks in Newport at this stage, though it would still be many feet below the levee in South St. Paul (the boat ramp just south of the Wabasha Bridge, however, would be underwater. With the highest water still more than a week away, it’s too early for a firm indication of when the river will reach a “it’s a big deal stage,” though based on recent floods, some roads along the river will likely be closed next weekend. Newer › Budget analysis: What’s Plan B?